Undoubtedly, you have a desk drawer filled with conference identification badges that you saved as souvenirs — some may spark up a bit of technostalgia, while a majority of them probably should’ve been thrown out years ago. Needless to say, none possess the functionality of the newly-unveiled TiLDA MKe badge created for Electromagnetic Field 2014 later this month. Described as a camping festival with a power grid and high-speed Internet access — or in simpler terms “a temporary village of geeks” — EMF Camp 2014 focuses on cultivating a marketplace of ideas that is unfettered by outside influences. Impressively, teams of dedicated volunteers run the entire conference. For this year’s event, these volunteers have created one of the coolest badge designs we have ever encountered. 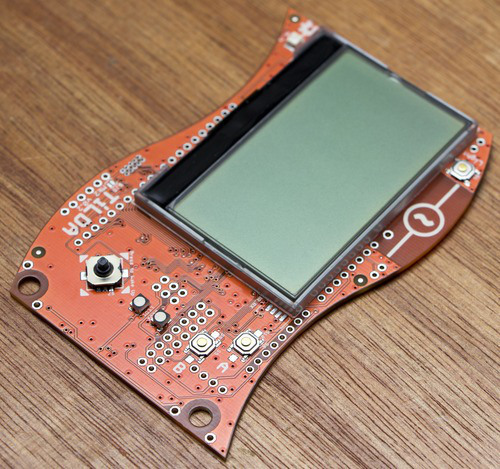 According to its organizers, the TiLDA MKe badge is a full-blown Arduino-based computer with an LCD screen and wireless connectivity. The badge, which is powered by an Atmel AT91SAM3X8E, allows attendees to browse the latest schedule which is automatically updated by a network of radio base stations across the site. In addition, it will also have a few other practical applications, including a handy torch-mode (with dedicated button) for locating your tent in the dark, a rain alarm, and as many fun applications as they can write in the remaining weeks. “We might even port some classic games for you to play on your way home,” the EMF Camp blog reveals. Every attendee will receive a TiLDA upon arrival, which they can take home afterwards and use it to experiment with programming. Cleverly, some of these workshops will actually be about ways that you can use and modify this Atmel-based badge. The compatibility of the TiLDA MKe will hopefully motivate attendees to experiment with the technology long after their conference is experience is over. It’s safe to say this badge won’t sit in a desk drawer for long! Electromagnetic Field 2014 will take place in Bletchley, UK August 29-31, 2014. For more information, you can head to the conference’s full site here or access the code and TiLDA design itself on github. 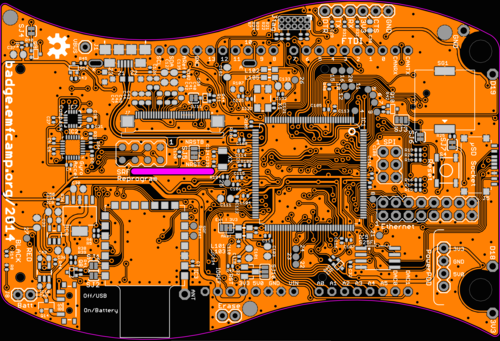 This entry was posted in Arduino, Arduino-Compatible, Maker Movement and tagged 32-bit ARM Cortex M3, Arduino Due, ARM Cortex-M3, arm microcontroller, AT91SAM3X8E, Electromagnetic Field 2014, EMF Camp, TiLDA MKe Badge on August 18, 2014 by The Atmel Team.